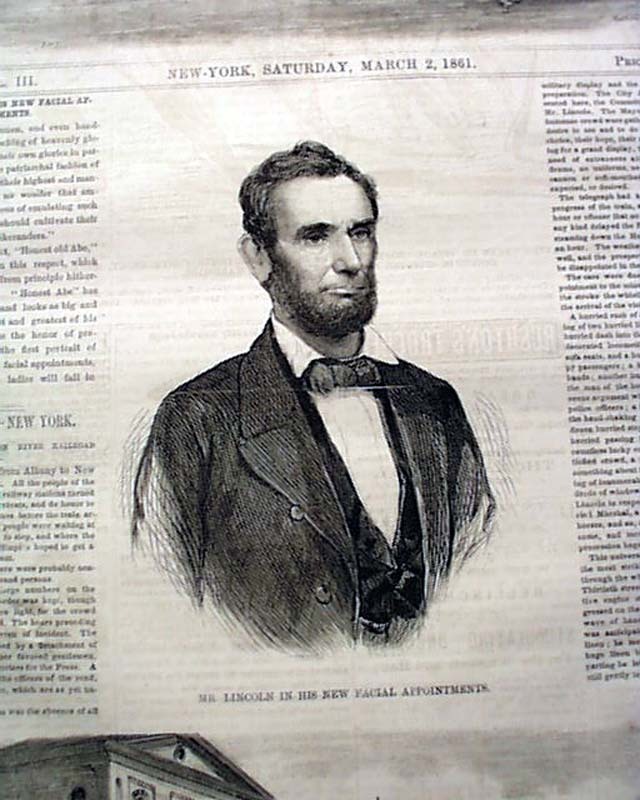 NEW YORK ILLUSTRATED NEWS, March 2, 1861 Because this is such an uncommon title and it seldom comes on the market, we rarely see the front page image of Abraham Lincoln, captioned: "Latest Portrait Of Mr. Lincoln". 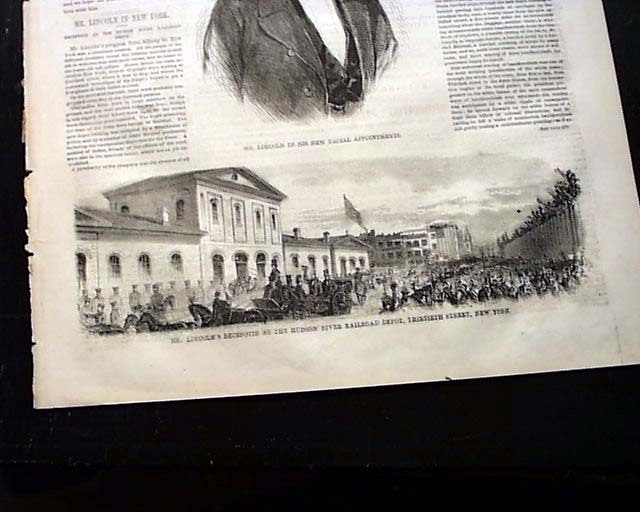 The bottom of the front page shows: "Mr. Lincoln's Reception at the Hudson River Railroad Depot...". 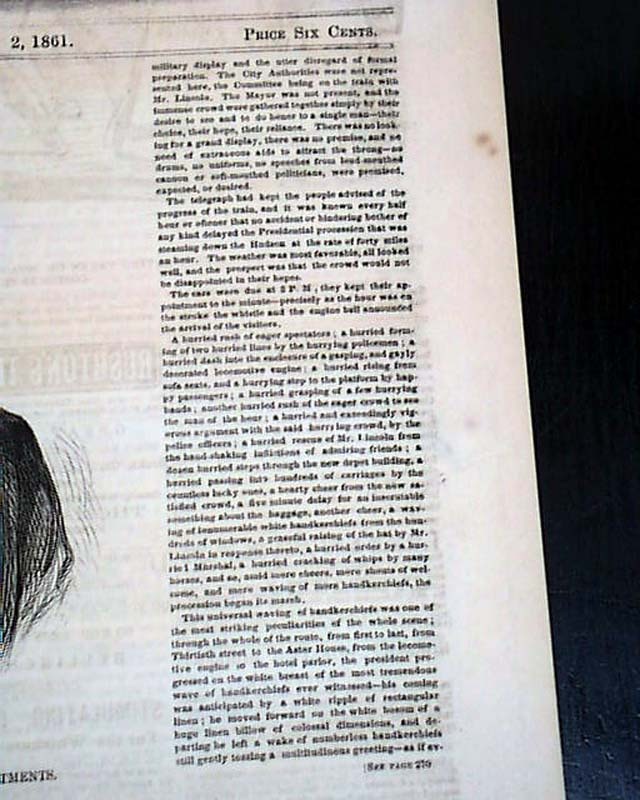 All of the text on the front page concerns Lincoln, the two articles. 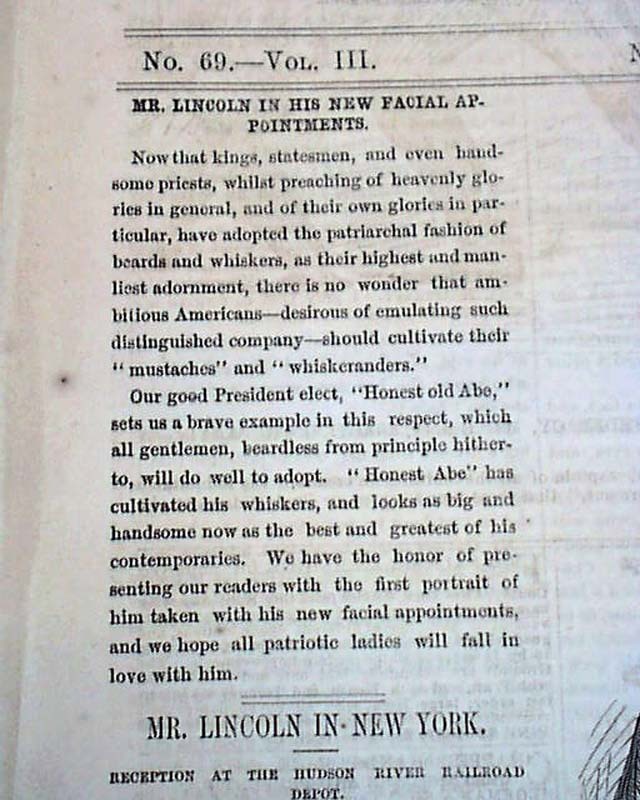 The first is headed: "Mr. Lincoln In His New Facial Appointments" and is interesting on Lincoln growing a beard. 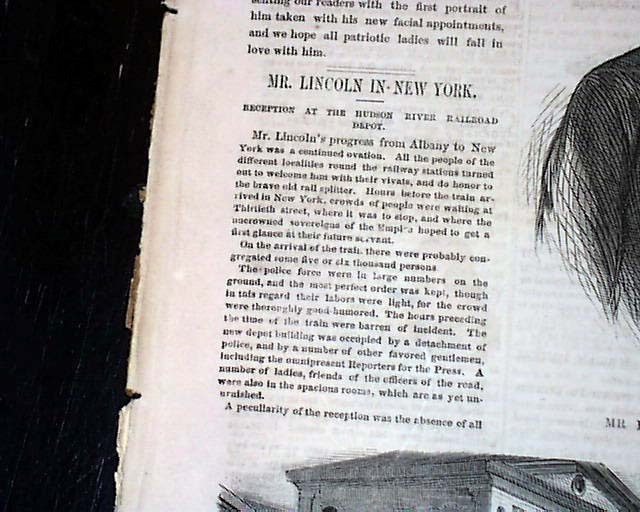 Portions include: "...Our good President elect 'Honest old Abe', sets us a grave example in this respect...'Honest Abe' has cultivated his whiskers & looks as big & handsome now as the best & greatest of his contemporaries. We have the honor of presenting our readers with the first portrait of him taken with his new facial appointments, and we hope all patriotic ladies will fall in love with him." The other ftpg. 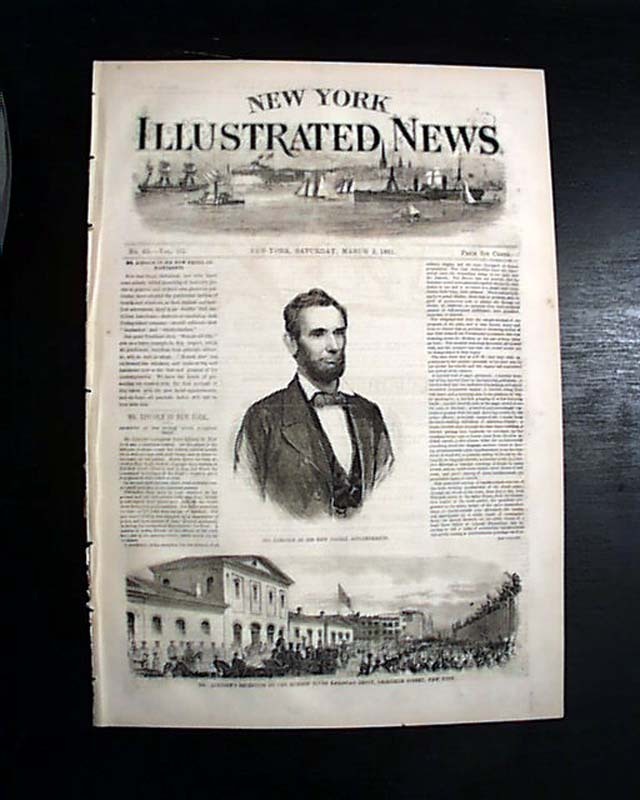 article is: "Mr. Lincoln In New York - Reception at the Hudson River Railroad Depot" which continues inside. 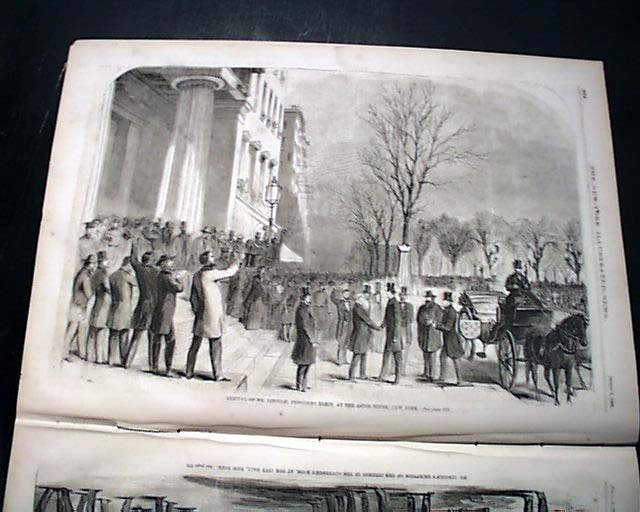 There are more Lincoln prints inside including a full page: "Arrival of Mr. Lincoln, President Elect at the Astor House, New York" and another full pg: "Mr. Lincoln's Reception of the Citizens in the Governor's Room, at the City Hall, New York". There are also smaller prints of: "Hon. 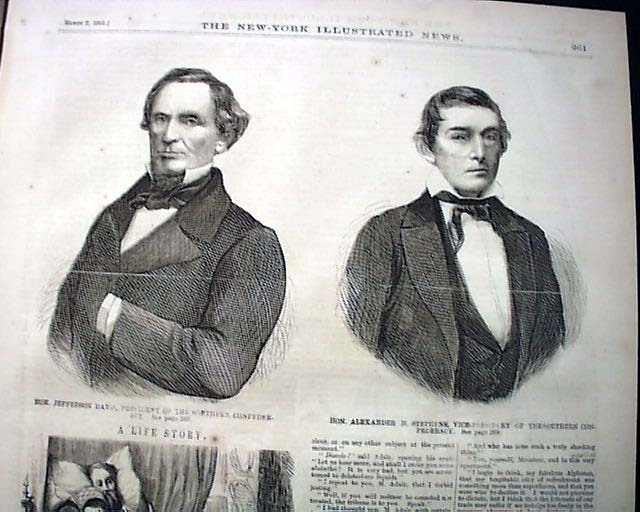 Jefferson Davis, President of the Southern Confederacy" and "Hon. Alexander H. Stephens, Vice President of the Southern Confederacy". Complete in 16 pages, some light dirtiness to inside margins, generally very nice condition.